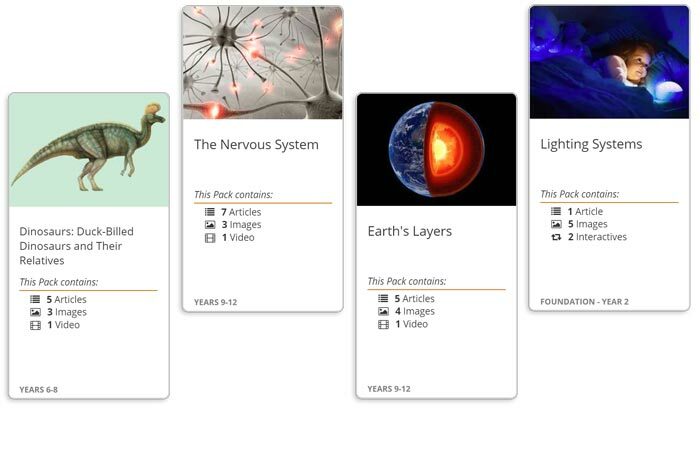 Ignite scientific curiosity with classroom ready content packs for all your Science topics. LaunchPacks: Science combines up-to-date, curriculum-aligned content sets with tools that make it easier for teachers to differentiate instruction and for students to understand core Pre-K-12 science topics. Teachers can weave relevant multimedia into lessons in one flexible, intuitive platform. Students actively engage with text and develop critical-thinking and inquiry skills through annotation tools, multilevel articles and diverse content types. How much does LaunchPacks: Science cost? A LaunchPacks: Science subscription will give all your students and teachers access, both at school and remotely. Pricing is based on student enrolment. Please submit a pricing enquiry to receive a quote for your institution or call us on +61 2 9915 8800. What other subjects are available? LaunchPacks is also available for Humanities and Social Science subjects. I belong to a Teacher Librarian or Librarian network. Do you offer special group or consortia pricing? If you are purchasing resources for more than one institution, you are probably eligible for a special price. Please submit a pricing enquiry or call +61 2 9915 8800 to find out more. I’m curious but I’m not ready to purchase. Why not set up a trial and start using LaunchPacks: Science for free? There is no obligation, plus your school will get access to all the content and features of a full subscription. Simply fill out the form and we will be in touch within two business days to set up your access. If you are not ready to trial, you can also request a demo or download the LaunchPacks fact sheet. What if I need help with using LaunchPacks: Science? We partner with you from day one to deliver a range of free training and PD options, including live and recorded webinars. You can also book a customised webinar dedicated to your staff and student needs. For teachers in NSW, completing Britannica LaunchPacks Training will contribute ½ hour of NESA Registered PD addressing 6.2.2 from the Australian Professional Standards for Teachers towards maintaining Proficient Teacher Accreditation in NSW. Welcome aboard! To place an order you can call +61 2 9915 8800 and speak to one of our customer service specialists, available Monday to Friday from 9am to 5pm (AEDT) or email us anytime.